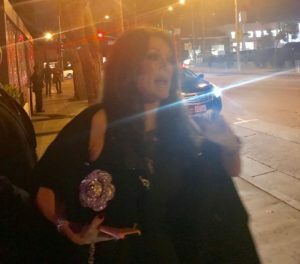 So, I saw Lisa Vanderpump last night at SUR restaurant in Los Angeles. For those of you who don’t watch The Real Housewives of Beverly Hills, she is the queen of the show. When I saw her come in the back door, I chased her through the restaurant, iPhone in hand. I was trying not to look too desperate. 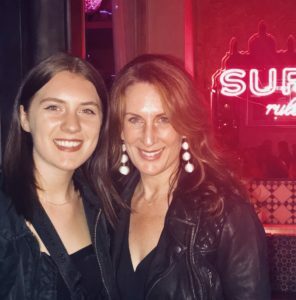 But then when I saw that she had made her way to the front of the restaurant and was surrounded by gasping women all with their iPhones in their hands, I realized I wasn’t alone in my admiration of her. I didn’t get a picture with her, but got a blurry shot of her waving us all common people good bye. I felt exhilarated that I saw her as I have always wanted to see her in person. She is actually more beautiful in person; she seemed like she was sparkling and she was wearing a long black cape that flowed behind her as she walked away that added to her drama and beauty. She was shorter than I thought, and quieter. I got the feeling that she really is quite a reserved person at heart. I fantasized about the rest of her evening of fun and friends and going to her huge home “Villa Rosa” at the end of the night. What an amazing life. As I sat back down with my daughter to finish our dinner I started to wonder why I admire her so much. What does she have in her life, that I don’t? Well, a lot of money of course. But I am sure she has the ups and downs of every person; heartbreak, loneliness, and loss of self-confidence at times. Money can’t solve those problems. The question always comes back to this; what do I really want out of life? I can always work harder and make more money, I can always cut off bad relationships and form new ones, I can always work on improving my mental health. But, what am I really looking for in all of this? A part of me thinks, I wouldn’t have any problems if I was Lisa Vanderpump, I mean look at her life! But even as I say the words I know that isn’t true. I guess I am looking for my real life to match the vision I have for my life. I have a vision about how I believe my life should be turning out, and the days that my vision lines up with reality are the best days! And I get the feeling of, “everything is working out”. But the days they don’t line up are painful, and I feel like I am failing. But I have never thought until now, what if my vision is wrong? What if what I have in my head as how my perfect life should be is wrong? And what if everything in my life happens according to my vision and I am still unsatisfied? That is a big questions for me, so I started to analyze why I wanted this vision, and asking myself what I really want in life. I crave newness; new images, new experiences, new friendships and new adventures. I also crave new perspectives, new ideas, new ways of thinking about things. So, knowing this about myself why am I still holding on to an old vision of my life that I thought I wanted when I was about 22 years old. Still at the core of me is the thought that, if I had Lisa Vanderpump’s money and life, I indeed would be completely satisfied. That is an old belief and an old vision. Plus its a story that I have seen before, it is nothing new to be rich and famous. We have all seen it before. I still love her and the show, but I watch it when I want my mind to relax because it is predictable and juvenile, I don’t watch it when I want to be challenged or really think about my life. I don’t know what Lisa Vanderpump’s vision for her life is or was, I know she has achieved what society considers success and maybe that matches with her vision so she is very happy, I hope that is the case. But even though I think I want her money and status, all my actions have been in the opposite direction of being a more private, thoughtful person that would rather read a memoir of someone I have never heard of than a New York Times best seller. So, what does my vision do for me except cause me more pain than pleasure? And for once, I have 100% control over getting rid of this pain. I can get rid of my vision at anytime and free myself of my own judgement, and just let life happen. I don’t have to ask anyone permission, or pay anyone, or take class or read about it. I can just say “Bye vision, you no longer serve me and I am not going to think about you anymore”. And I can catch myself when I experience pain by comparing my real life to my vision of my life I came up with at 22 years old, and I can without an argument or bad feelings say ‘goodbye’ and never look back. Hi Leanne, thanks for the great comment! I like to watch the show also for all the amazing homes, cars and clothes that they have. And even when they have drama it looks glamourous. : ) . But then I think of all the stories I have heard of rich and famous people that have all these things but are very unhappy, and it makes me realize that personal fulfillment doesn’t have anything to do with lifestyle. I like what you said about waking up every morning and committing yourself to being your best in your life. I think you do an AMAZING job at everything you do, especially at being a good friend : ) . Love you! What I have learned so well over the years is that someone ALWAYS envies and has misconceptions of someone else’s life. I’ve been getting emails for years upon years from people who read one of my blogs, that I inspire them and they wish they were me. But if they only knew what my life outside the fun blog stories is they might run the other way. So yea, that was the long way of saying we’re all wrong when we assume others have a cooler life than we do. Thanks! When we only see one part of someone’s life that looks fun or glamorous, it is easy to assume that everything is working in their lives. Especially if the person is traveling to beautiful places and it looks like they have a fun amazing lifestyle and not answering to anyone and we are only seeing that part of their lives, not any of their personal struggles. Thanks for the comment!